This is the first preview of a major release we’re working on for early January 2008. Page-level access. 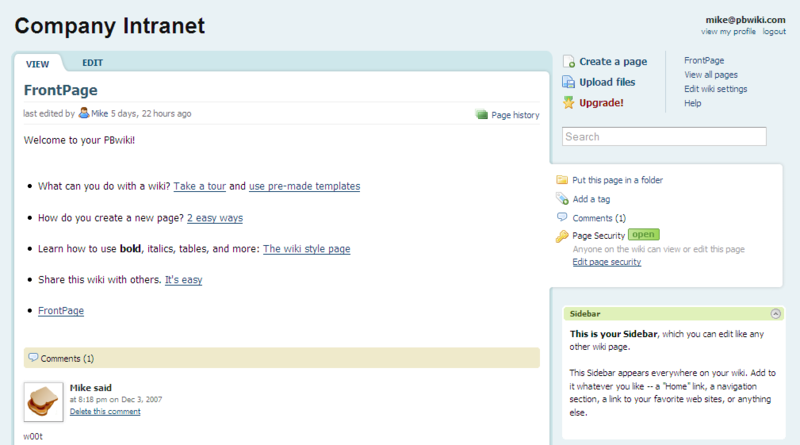 If you’ve ever wanted to allow certain people access to specific pages on your wiki, now you’ll be able to. Page folders & folder access controls. This new feature will allow you to put pages in folders to better organize your wiki. A godsend for large wikis! Improved logins. A few months ago, we noted how logins on PBwiki are more confusing than they need to be. In the new release, we’ll be improving logins and making it easier to track who’s doing what — and to make sharing easier. We have a limited amount of Golden Tickets to try out PBwiki 2.0 as a beta user. If you’re interested in trying out PBwiki 2.0 and giving us feedback, sign up for PBwiki 2.0 beta access. We’re excited about the new release and will keep you updated beginning in early 2008! We want to welcome Paul Singh, our newest member of the PBwiki family. As the Director of Support, he’ll be responsible for getting you the help and training you need from PBwiki. Paul has an extraordinary background in Saas (software as a service) support. In the past, he’s built up a support organization for a $48 million dollar SaaS product. Look for rapid improvements in PBwiki support coming up, including better training materials and answers to common questions.